A freeware release is available which also has modding support. The game can now be played in a web browser in two versions. HD version and FreeDink version, both having an option to play custom adventures. HD Freeware version. Original can be found here. Dink Aural+ A source port of the original game which only provides the MP3 music support and faster MIDI loading. Very few mods take advantage of it. FreeDink A full port of the game using SDL interface which adds an OGG/MOD/IT/S3M/XT music support, a 64 bit binary, multiple language support, fast forward feature from HD edition and a modern PC compatibility. Besides that, it also includes the updated front end called DFArc3 which includes some more features. HD Edition An official port of the mobile version. It adds the fast forward button, quicksave and quickloading, a modern interface, CD music, Linear filter, a built-in library of Mods available in Dink Network, PNG support and 64 bit executables. Compatibility issues are somewhat rare. Toggle in settings or with Alt+↵ Enter. Fullscreen is always borderless in Dink HD. Toggle in settings or with Alt+↵ Enter. Capped at 60 FPS in both HD and original version. Only the main menu. However it can be used to select a dialogue while interacting with some NPCs. Works only in Windows 95/98/2000/XP. For newer OS you must use FreeDink. You have to select a function for each button. However, custom commands cannot be remapped. Only for Dink HD. However, you can change the volume for music only. 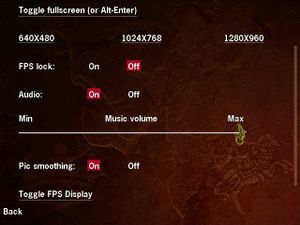 In case of SFX it can be toggled on or off. Depends on the script outside the original game. Dialogues only. Although it depends on a script outside the original game. HD edition and FreeDink only. This page was last edited on 4 November 2018, at 23:37.